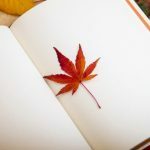 Notes: article modified on 10/10/2018 at the request of Cowlines to show the performance of the app on an iPhone. 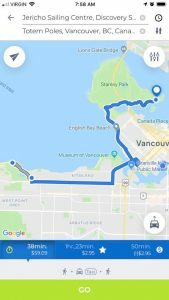 How do you get around the city? Do you know how to combine transport systems to move in a sustainable way? 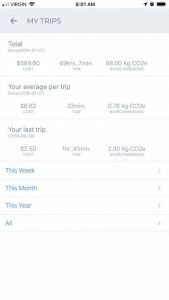 Cowlines is a new app for planning trips that allows you to forget about the private car. At the moment, it only works in Vancouver (Canada). However, over the next few months it will be activated in other cities in the U.S. and Canada. 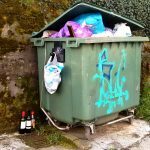 Cowlines also plans to start operating in Europe soon. In fact, Madrid and Barcelona will be two of the cities to which service will be provided. 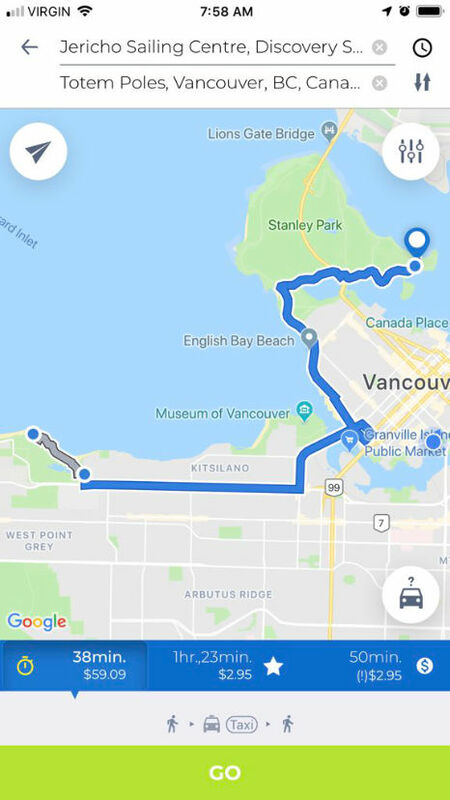 The description will focus on Vancouver, imagining a hypothetical trip between Oak Street and Pacific Coliseum Stadium (approximately 12.5 km) for the video example and Jericho Sailing Centre – Totem Poles (approximately 13 km) for the image gallery. First of all, you will see an option to create a user account. The application is operational though you do not register, but if you want to keep a record of your trips, you can create a profile. Also, for the proper functioning of the application, it is recommended to have activated the geolocation. 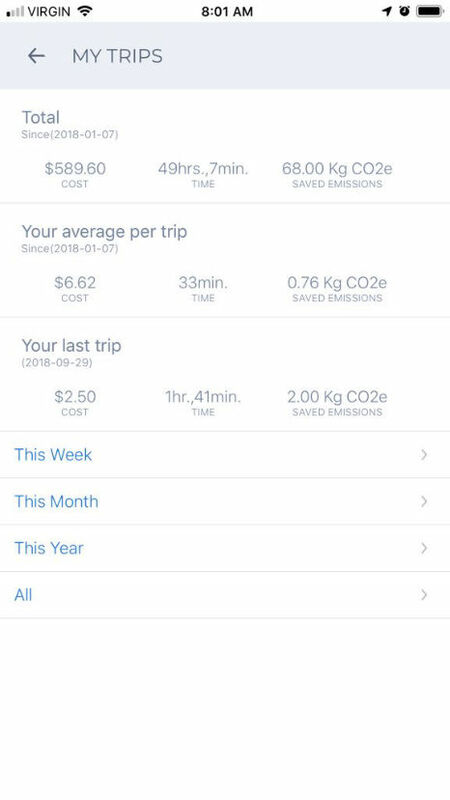 check travel history and see costs, time spent and CO2 emissions avoided. The mechanism for calculating emissions is verified by the Government of British Columbia and an international standard and has aroused the interest of entities such as the World Economic Forum or the World Bank. configure options such as map type or maximum walking time. If you modify this last parameter, the app automatically recalculates the itinerary. ask for help and send feedback. consult the terms of service. A button to geolocate yourself on the map. A destination search option (green bottom bar). The next step is to enter a starting point (or use your location) and an arrival point with Search your destination. Based on these data, the application displays the fastest, recommended and cheapest option. Estimated prices and travel time vary depending on the urban means of transport selected/available. To see the different options, click on the icon at the top right. 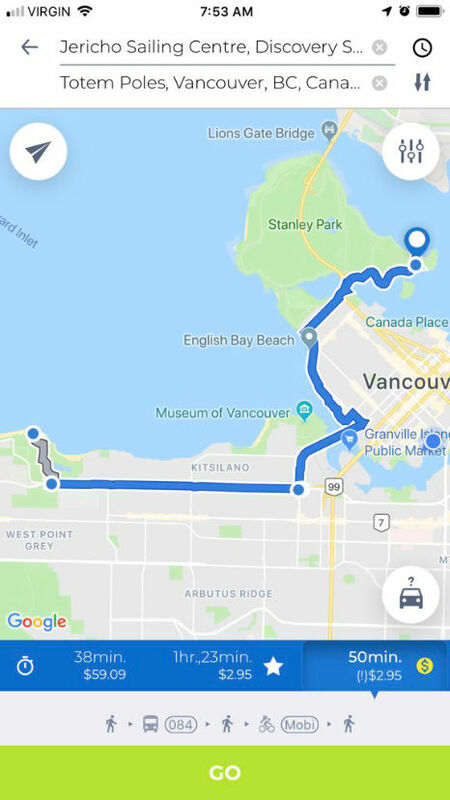 In the case of Vancouver you have at your disposal taxi, shared car, shared bicycle, train, subway, ferry and bus. With your final journey selected, click Go to see a detailed map. 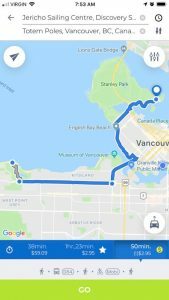 Scroll through the screens to see the itinerary and the stops where you can get off or transfer. It is also interesting the information provided by the icon at the bottom right represented by a car and a question mark. 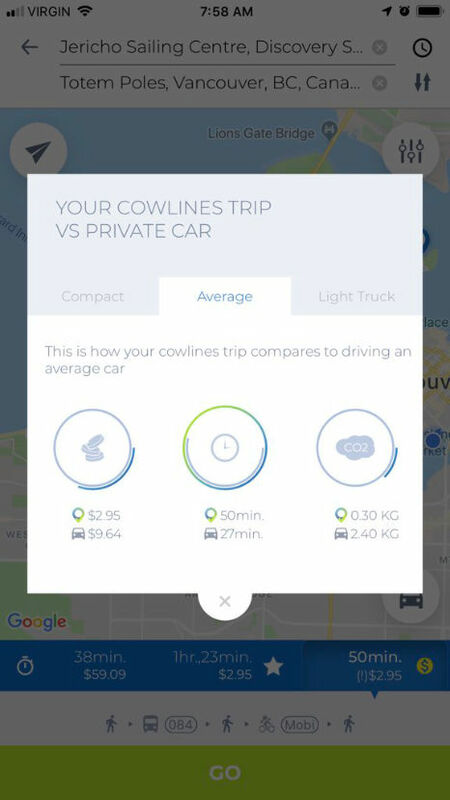 This option shows a comparison between the selected Cowlines travel option and a private vehicle, showing the data related to cost, time and CO2 emissions. The screenshots, provided by Cowlines, correspond to the iOS version of the application. The following video, recorded using an iPad, shows the different functionalities of the application (3 min 18 sec). However, the Cowlines application is optimized for iPhone, device in which shows its true potential and agility as can be seen below (1 min 19 sec). What do we need to offer to compete with car ownership? This was the question that they asked themselves in Helsinki when they began to define what the urban transport of the future should look like. The solution? Facilitating the use of existing transport in such a way that the use of the private vehicle was not a viable option. This is how “Mobility as a Service” (MaaS) came into being. the elimination of silos created by urban transport operators. the establishment of payment facilities from mobile applications. the development of supporting policies. 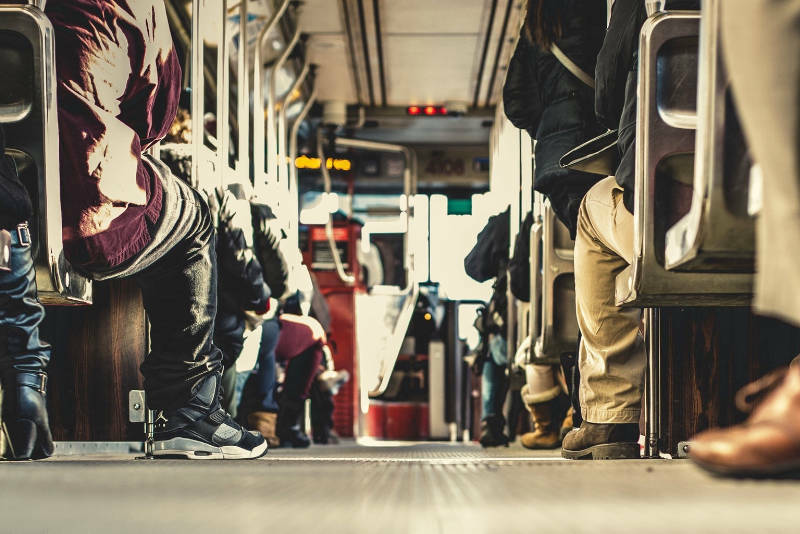 Although Cowlines cannot be considered as a MaaS application (it does not incorporate a payment system or a means of transport booking option), it stands out positively for facilitating the use of urban transport by integrating in the same app the services offered by the different operators. In this way, the user does not need to consult different web pages or applications. However, there is a lack of integration of a real-time information system to warn of the transit of the various transports, although for the calculation of travel time the system takes into account the state of traffic. 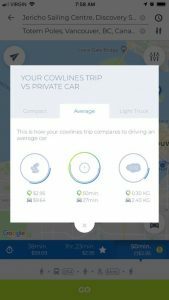 It would also be interesting to be able to edit some variables such as cost, so that users can manually enter the price of travel and keep a more accurate recording. It would also be useful to include a small legend to help identify the different transports. Although the icons are quite representative, tourists and occasional visitors may find it difficult to identify the different transports.